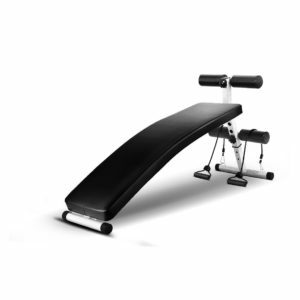 Here is an innovative and ergonomic design multi-purpose decline and incline bench and slant board by FabFit with a very long and thick back cushion (vinyl cushion pad and dense foaming) and four incline positions for efficient and comfortable sit ups, twists, crunches and reverse crunches to work your abdominal and core area (similar to the model offered by Oukang Fitness). The advantage of having an extra long bench is it will accommodate people of all heights, including the very tall. The main reason it has such curve is to support your spine and the natural curve on your lower back- not to have a gap on there and to avoid lower back pain or potential injuries. Back cushion is 2 inches thick and will offer great support for your spine and you will get to do a very efficient workout. It also includes dual roller pads for your ankles that are PU wrapped and with chrome end caps so as to keep your legs and body safer when you’re working out- less strain and less injuries as they are at an ideal distance. This is both an incline and decline bench, depending on where you position your head and body in which direction. You can target slightly different parts of your core section with the 4 adjustable decline positions and give your abdominal workout a bit of a boost which will also meet the needs of beginners and advanced users. Fabfit Curved Ab Bench is a very solid unit but still lightweight, maximum user weight it can have is 250 pounds, doesn’t have a folding design but has an assembled footprint of 57 x 16 inches and will not occupy much space, is not shipped assembled but the manual and the necessary tools are included and all you need to is to screw the pieces together (easy assembly). If you don’t have a lot of space in your room you might want to lower it and lean against a wall or in a closet. It will give you a nice core workout and with the included resistance bands you can work on your upper body as well (you will be using the energy in your core area to be more stable overall) and use it as a resistance training tool, both the foot rest and back rest are quite comfy and the quality is very good, actually almost like the benches you will see at your gym but at a much lower price. You will achieve great results like slimmer waistline and tighter abs by using it regularly a few times a week and with the right diet.